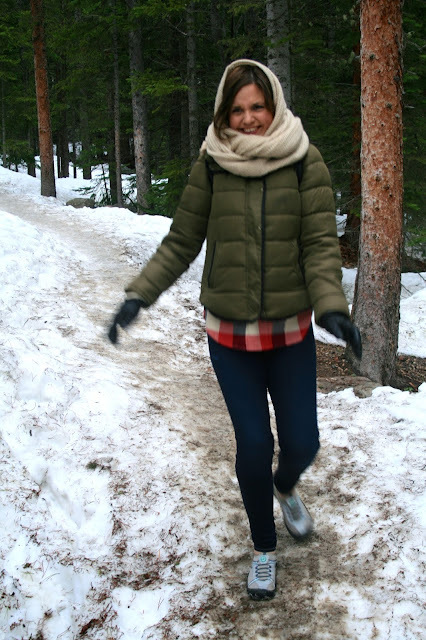 This week's travel post is the second post of our trip to Colorado. If you missed the first post, you can catch up HERE. 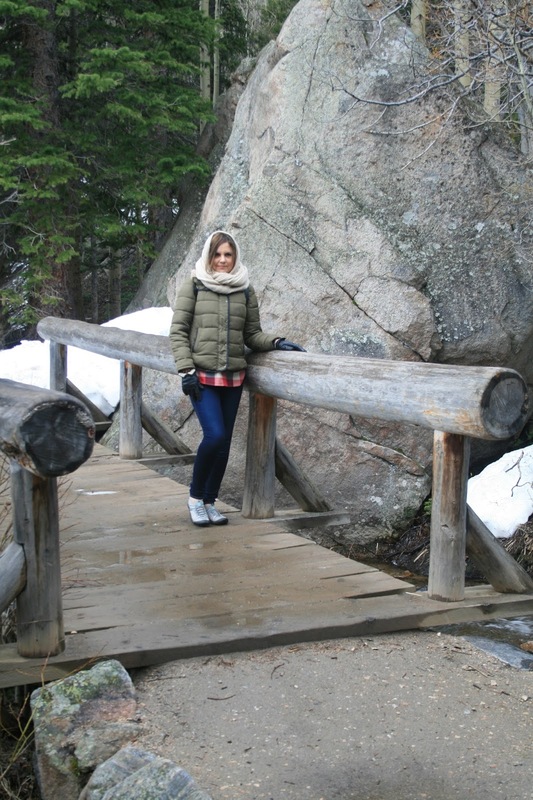 On our second day in Colorado, we went to visit Rocky Mountain National Park, and let me tell you, I was excited beyond excited. I've been to many parks before, but this was the first time I have ever been to a 'big name park'! I mean, this is famous park artists write songs and poems about. This is a park I've seen pictures of my whole life, and could only dream of going! I couldn't believe I was finally here! Somebody pinch me! This is the view when you just start to drive into the park. Really, if it's this pretty already, what else must be inside? We were anxious to find out, and it certainly didn't disappoint. The fee to get into the park is $20.00 per vehicle. That's it. No extra fees for parking, or for the number of people in your car. And it is good for one week. The only complaint I have is, I wish they had a day pass for a reduced fee, because we only planned on spending one day in the park. Even though the weather was in the sixties that day, because of the higher altitudes, it was quite chilly the morning we arrived in Rocky Mountain National Park. From past experience, I learned to dressed in layers and I brought my winter coat with me. I wore extreme stretch skinny jeans, a tank top, flannel shirt, outerwear, and a scarf. 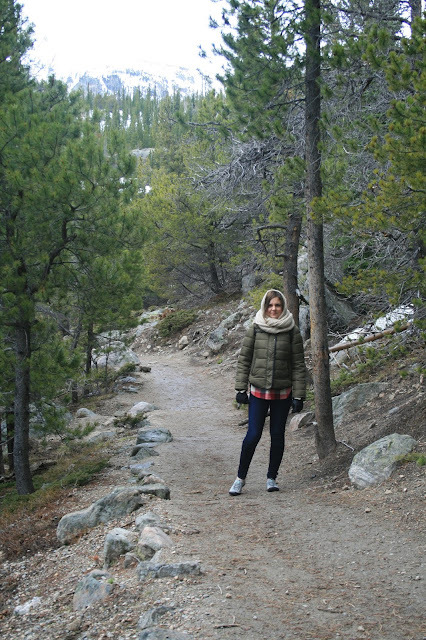 The higher in altitude we climbed, the colder I got, and I ended up using my scarf as a hat too. My husband laughed at me and said I looked like a woman from the Middle East, but I didn't care, I was toasty warm. But one thing I wasn't prepared for was snow on the trails. 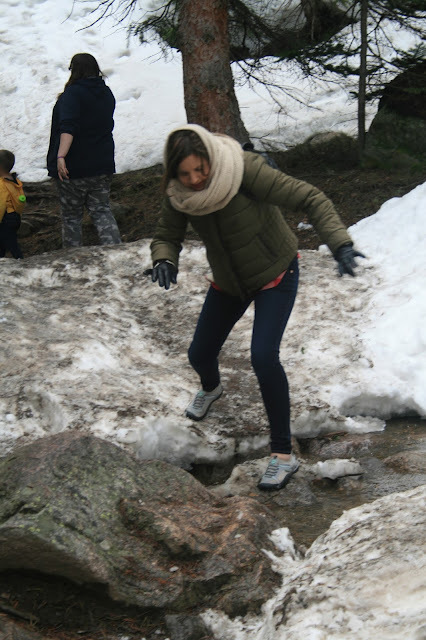 I knew the tops of the Colorado mountains are snow-covered all year, but I never thought there would still be so much snow on the trails at the end of May. Everyone who reads my blog knows how much I despise snow and cold, and here I was, back trudging in the snow again! Didn't all this stuff just melt at my house a few weeks ago! UGH! The worst part about the snow was I had totally the wrong footwear. When packing for the trip, I considered for one brief second that MAYBE I should bring my snow boots. But no, I thought, that would be ridiculous, why would I ever need snow boots at the end of May? Even if there was snow, it would be such a small amount that they wouldn't be necessary. Boy, was I wrong. Instead I brought my water-wear hiking shoes that are meant for hiking on wooded trails and across streams. They had no grip whatsoever for snow or ice, and I couldn't walk without slipping for the life of me. I had to walk so slow or I'd start to fall, and at one point early on, I thought of just giving up because at the pace I was walking, we'd never get anywhere. And then, I reached the point, where all I could do was laugh. Here I was, Amy the lover of warmth and sunshine, who just left her home where it was finally sunny and in the eighties all week, to come back to winter, her most hated time of the year and freeze and fall down on the ice and break a hip. I laughed with every single step and slip. I laughed so hard I peed my pants…not a good thing to do when your on a trail in the middle of a forest with no bathroom for miles. My husband, kept walking ahead of me…skipping away with ease with his snow boots on. Yes, he was smart enough to bring HIS snow boots, but did he insist I bring mine? Oh no! Instead he photographs me as I struggle to stay balanced, laughs at every slip I make, and calls me 'A Little Princess', because of my un-athletic ability. I must admit, these pictures are very funny. I definitely do not have one athletic bone in my entire body, but I proudly wear the title 'Little Princess'. However, I will cut my husband some slack. He wasn't being mean, he thought I looked cute and was enjoying the moment. And eventually we learned how to move faster on the trail by playing 'choo-choo'. He walked ahead of me and I placed my hands on his shoulders while he shuffled his feet and I just slid mine on the ice. It worked very well actually. The worst part about my footwear, is that I didn't even have socks on, because you don't wear socks with these kind of shoes. So my skin was exposed above the ankle, and my feet got quite damp and cold. The snow and ice even wore my red toe nail polish right off the edges! But thankfully, I did not get frostbite! Eventually, we got out of the deepest part of the snow, and had a lot of snow-free trails so we could stop looking down, and look around and enjoy the view. There are no bad views in Rocky Mountain National Park. Every where you look is sheer beauty and always a backdrop of a snow covered mountain. The trails in the park are very well-maintained and well-marked: which I really appreciate! I've been on way too many poorly marked trails in my hiking adventures across the country, so I really appreciate it when trails are taken care of. 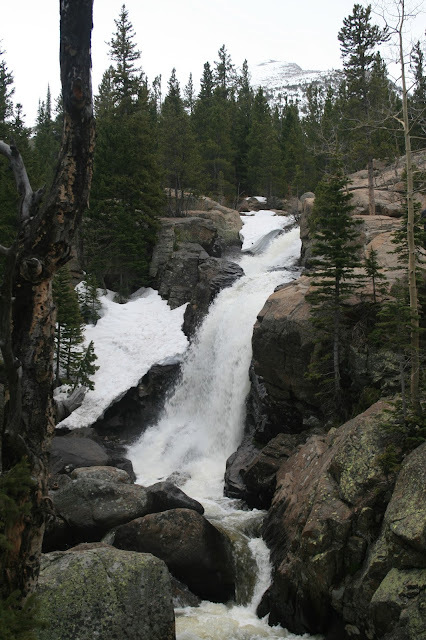 When we first got to the park, we decided to take the trail to Alberta Falls first. There are over three hundred miles of hiking trails to choose from in Rocky Mountain National Park, and we had no idea how long all the trails would take. So we just picked our favorite ones by reading the descriptions of the trails and talking to Park Rangers, then we put them in order of which ones we wanted to see the most and hit those first! 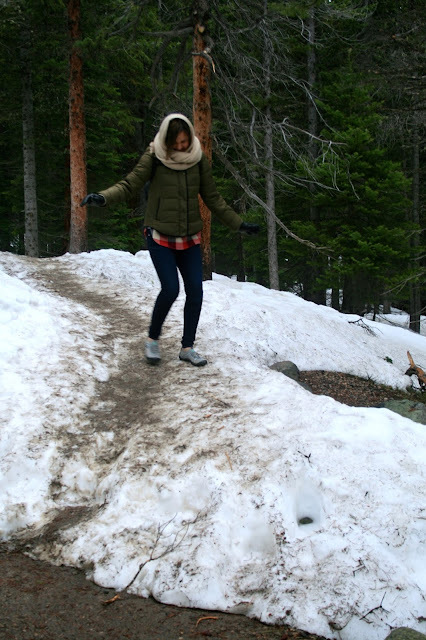 The trail to Alberta Falls is considered 'fairly easy', which is probably true if there is no snow and ice on the ground and you have appropriate footwear. But because of the weather, I found it a bit difficult at times. 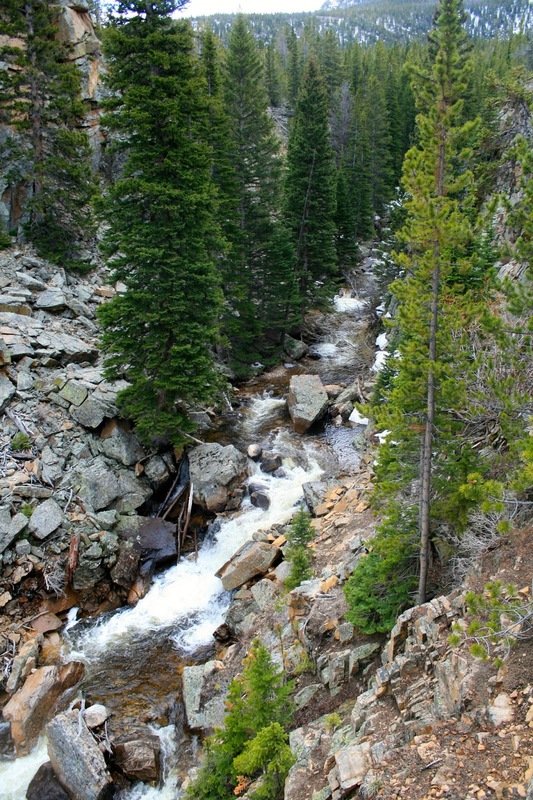 Round trip, the trail is 1.7 miles with an elevation of 9400 feet. 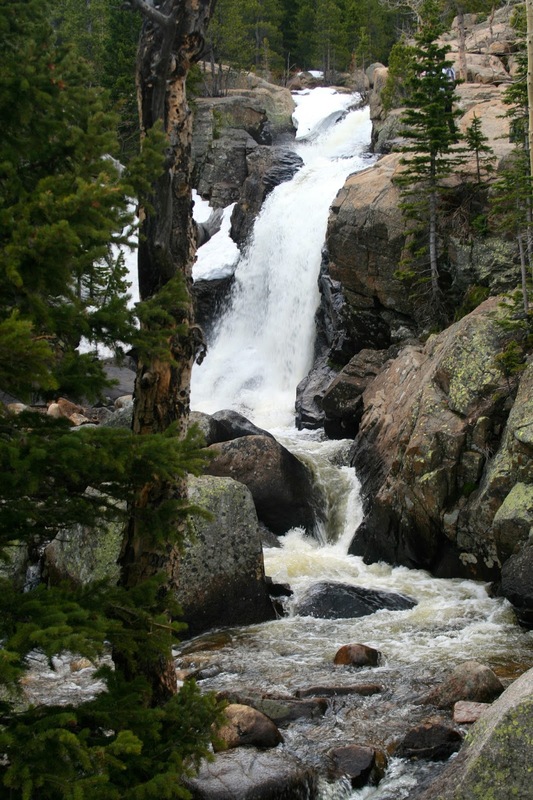 An interesting fact about Rocky Mountain National Park is that it is the highest national park in the country with elevations ranging from 7,860 feet to 14,259 feet. There are 77 peaks above 12,000 feet. That would explain why you get an amazing view from just about anywhere in the park! The hike to the falls alternates between a mixed pine forest and aspen groves. 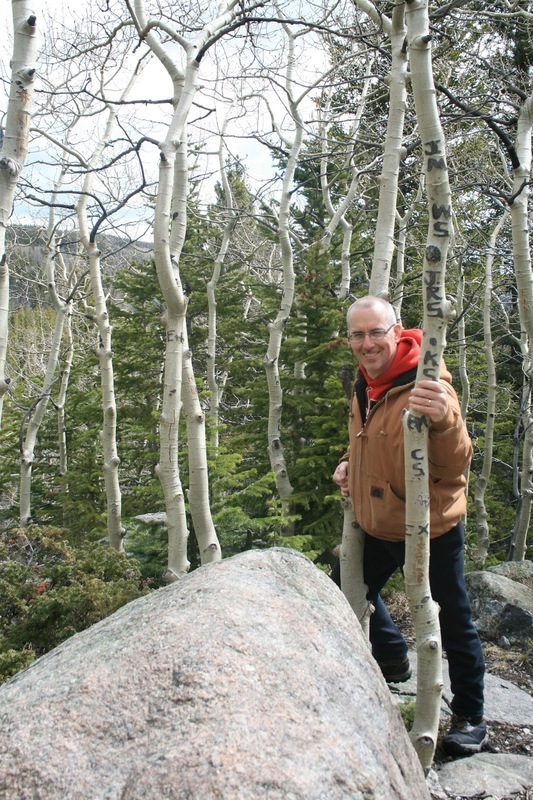 My husband and I were enthralled with the pretty white bark of the aspen trees. 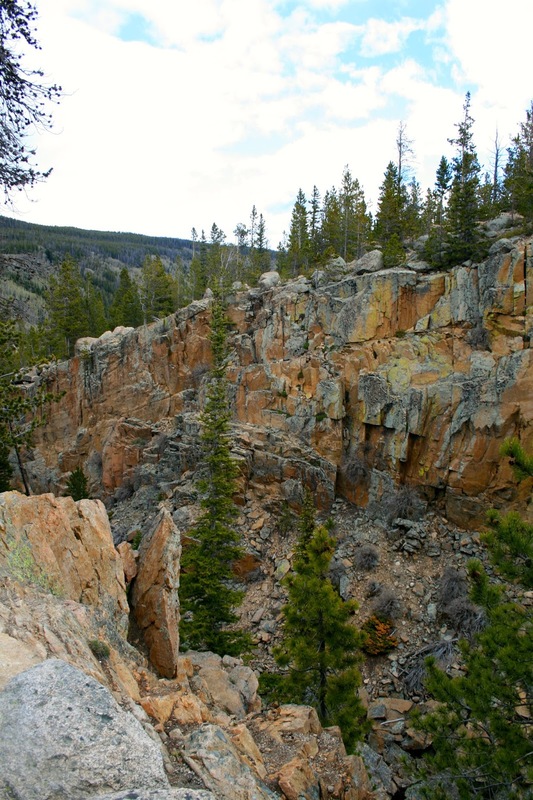 There are also many lovely bubbling brooks and amazing rock formations to admire on the trail as well. After hiking a bit, we reached this beautiful gorge and knew the waterfall couldn't be that much farther up ahead. While taking pictures of the gorge, we met this sweet couple and stopped and talked with them for a bit. One of my favorite things about traveling is meeting interesting people. I adored this older couple for they were so cute and 'in love'. I looked at them, and saw what my husband and I will be like when were their age. They told us hiking was a lot easier when they were in their fifties, and it's much more difficult for them now, but they still get out and enjoy it. They were so inspiring, and a perfect example of getting out and enjoying life in your golden years. Not too far after the gorge, we reached Alberta Falls. It's a beautiful, thirty foot waterfall, not as impressive as all the amazing waterfalls I saw in Mount Washington National Forest, but gorgeous nonetheless. But it did have something Mt. Washington waterfalls did not: a backdrop of snow-capped mountains! After you reach the falls, you have to just turn around and go back the way you came. There is no quick loop to get a different view on the way back (unless you want to hike for miles up to Glacier Gorge and come back around via all the lakes). But that route would have taken all day, and by now we were getting hungry and needed to use the bathroom, so we headed back to our car. If you read my Estes Park post, I wrote about my fears of running into a bear or a mountain lion in Rocky Mountain National Park. It turned out, I had nothing to worry about. The park was so crowded, I think the bears and lions run away and hide. I was actually shocked at how crowded the park was in May, and I can only imagine the crowds during the peak travel season. There were tons of people on the trail we were on. We got to the park very early, so we had no problem finding a parking space near the trail. However, by the time we got back to our car to have a picnic lunch, the parking lot was so full, cars were driving in circles looking for an empty space: and this was a HUGE parking lot. During the parks busiest seasons, they actually have a 'park and ride' shuttle bus where you can park your car in a lower, larger parking area and then be 'shuttled' to the parking lot where the trails start. When I read reviews of the park on-line, everyone said get there as early as you can for it does get very crowded in the afternoon…and I agree! Before I conclude this week's travel post I must leave you without a picture of one of the other little friends we made in the park. Chipmunks and birds love park visitors and they are very friendly. If they see you coming, or stop to eat a snack, they will quickly come over and 'beg' for some too! The park doesn't like it when you feed the animals, but if you take some healthy treats, liked peanuts or cracked corn, the critters would sure appreciate it. This little guy took a nut right out of my husband's hand. They are just too cute! What a sweetie! I'll have many more cute animal pictures in my next post, as Rocky Mountain National Park was just too big to fit into one post. Nice photos Amy and as usual you are looking good also in the show! Amazing scenery- love the shots! Thanks for sharing! I can't tell you how much I appreciate your travel posts. Will surely put this trail on our list of hikes. Beautiful photos, and I can tell how much fun you had, although there was SNOW on the ground. Can't wait to read your next post!